Following on from Northern Ireland’s Causeway Coastal Route, your first venture into the Wild Atlantic Way brings you to the Northern Headlands. Nature is spectacular and bracing here, from the sheer granite walls of some of Europe’s highest sea cliffs at Slieve League, to the Northern Lights dancing in clear winter skies, to millions of seabirds gathering in great estuaries. Beginning on the border of Counties Londonderry and Donegal at Muff, this trail weaves around the great wilderness of the Inishowen Peninsula before striking out to the epic coastline of the northwest. 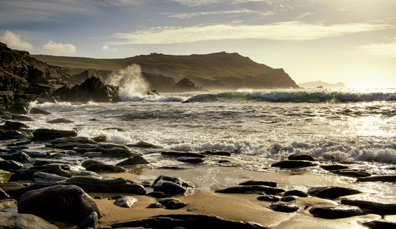 Turbulent seas, clouds rolling across the sky, seabirds whirling in the air – the Northern Headlands opens up with dramatic scenery and rugged flair on the Inishowen Peninsula. When they say Donegal has a wild side, that includes the seas and skies. If the weather is favorable, look up and catch the Northern Lights (Aurora Borealis). 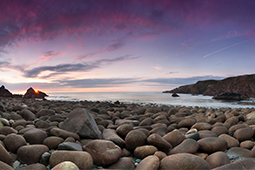 While they are dependent on the right climatic conditions, Inishowen is often graced with their phenomenal light show. These dancing colors hanging over Banba’s Crown and Malin Head are an astonishing sight; no wonder the Star Wars filmmakers chose it as a location for The Force Awakens: Episode VIII. Fancy a trip out on the water in search of curious ocean creatures? Take a whale-spotting boat tour from Bunagee Pier – you might be lucky enough to witness the likes of common and bottlenose dolphins or minke whales breaching the surface. Meet Donegal chef Brian McDermott (aka The No Salt Chef) at his cookery school in Moville. With such epic surroundings, there was always going to be a deep-rooted relationship between the wonderful people of Inishowen and the sea. Intriguing tales of how local life has been nurtured by nature, and insights into what lies beneath the ocean can be found at the Inishowen Maritime Museum and Planetarium in Greencastle, which houses information on everything from basking sharks to B17 bombers. Be sure to also visit the remarkable Church of St Aengus (1967) in Burt, which was inspired by the ancient stone fort, Grianán of Aileach. For a hearty meal to fuel you on your journey, head to Nancy’s Barn in Inishowen for a bowl of their award-winning seafood chowder. The road out of the Inishowen Peninsula cuts through some 3,000 acres of land reclaimed from the sea in Burt, and makes for an excellent spot for birdwatching and walks. 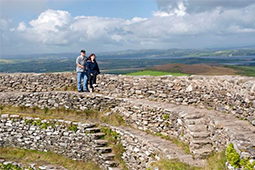 But we're heading up the hill to the renowned Grianán of Aileach, a restored prehistoric circular fort with simply spectacular views. This feat of architecture was even referenced by Greek astronomer and geographer, Ptolemy, in his 2nd-century map of the world. Travel back in time to the 6th century. Europe had been overrun by pagan tribes but was in the midst of being Christianised again by a resurgent Irish church. Saint Colmcille was the pre-eminent figure in this period, not just in Ireland but in all of Christendom. His story is told through beautifully reproduced artefacts and panels at the Colmcille Heritage Centre, alongside artwork from local artists. For another intriguing exhibition, make a beeline for Glebe House & Gallery: the Derek Hill Collection, which houses works from artists such as Picasso and Kokoshka. Dine out in the Lemon Tree Restaurant in Letterkenny: contemporary Irish cooking inspired by classic French roots. Delicious. Rising to fame for one of the world’s most beautiful lighthouses and the Flight of the Earls, which took place here in 1607, you will be forgiven for forgetting these details once you check out the panorama in front of you. Get your camera ready. This wildly exposed headland is a wonderland of wildlife, including grey seals, dolphins and seabirds. 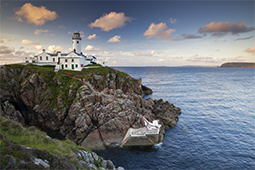 But the jewel in the crown has to be Fanad Head Lighthouse, which has been safeguarding seafarers since it was built in 1817 – a response to the tragic shipwreck of the frigate, Saldanha a few years earlier. 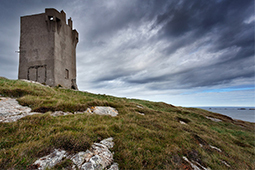 Climb the 76 narrow steps to the top of the tower for superb views of the northern coastline, hear the stories of shipwrecked parrots and lost gold on the lighthouse tour, or stay in one of the lightkeepers’ cottages and take the time to enjoy this beautiful spot. Pay a visit to Doe Castle, where shipwrecked survivors of the Spanish Armada were said to have been given shelter. Set within 16,000 hectares of National Park you’ll find Glenveagh Castle. This majestic stronghold with its turrents and round towers was built by John George Adair, a Laois man who made his fortune as a speculator in America during the 19th century. He wanted the castle to stand out amongst the jaw-dropping scenery that surrounded it… and he succeeded. Glenveagh has hosted an impressive roll call of glamorous guests, including Marilyn Monroe, Charlie Chaplin and Greta Garbo. A castle with real star power. After strolling the grounds, it's only fitting to relax in Glenveagh Castle's Tea Rooms and Restaurant for home-cooking at its very best. Take a boat trip to the Irish-speaking island and visit Tau Cross. Locals are sure to regale you with tales of Tory's past. The island was a stronghold of the Fomorians, a supernatural race whose best known figure was Balor of the Evil Eye! Despite its sinister moniker, Bloody Foreland has no tragic history to warrant the title. Instead, it derives its name from the evening sun that illuminates the rocks to a rich red hue. But this is Ireland, and where no facts exists, there is always folklore. This tale focuses on an unlikable warlord “Balor of the Evil Eye”, (yes, him again) who was eventually slain by his grandson Lugh Lámh Fhada. Some say that the tide of blood that flowed from Balor’s Evil Eye was what stained this hillside. Fact or folklore, the views from here are simply breathtaking. 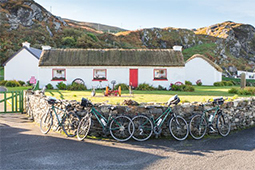 Hang out in a local pub like Teac Jack or Teach Hiúdaí Beag, or head to Leo's Tavern – renowned for being the family home of Enya, Clannad and Moya Brennan. 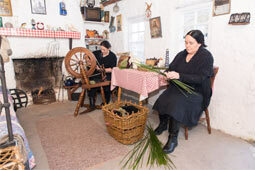 There's a whole lot going on around Dungloe. Delve into the town's musical heart and you'll find one of Ireland’s most famous entertainers, Daniel O’Donnell, celebrated at the visitor center on the main street. Linger here a while to enjoy a rip-roaring live traditional Irish music session in Beedy’s Bar, owned by the family of Moya Doherty, co-founder of Riverdance. 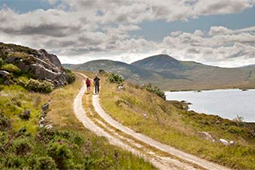 And if you arrive at the start of May, you’re just in time to join the Dungloe Walking Weekend – plenty of craic guaranteed. 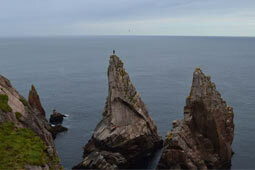 If that’s all too much to take in, the gravity-defying Arch Stack at nearby Maghery is sure to take your breath away. Take a trip out to Arranmore Island from Burtonport. You can even charter your own vessel with Inishfree Charters, and see it all at your own pace. The town of Glenties lies at a point where two glens and two rivers converge, the Owenea and the Stracashel – the Owenea is the one better known for fishing. Our advice is to bring your fishing rod, get your permit from the Owenea Angling Center and start teasing for a bite. For those who want to leave the wellies behind, wander the rooms of St Connell's Museum and Heritage Centre, where you'll find a moving commemoration of the Great Famine of 1845-1847, which saw Donegal’s potato crop obliterated. 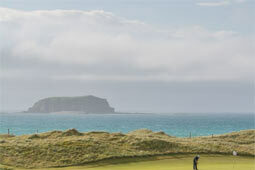 Golfers also take note: the Narin and Portnoo Golf Club is a scenic 18-hole links course with sweeping views of Gweebarra Bay. Anyone for tee times? You'll be utterly charmed by the warm welcome you receive in the close-knit community of Ardara. While at the Donegal Tweed Centre, find out all about the tradition of hand-weaving tweed (we challenge you to leave without bringing a sample of this beautiful fabric with you). 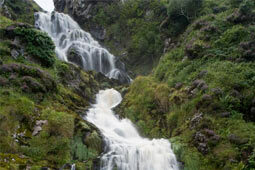 Just outside Ardara, meanwhile, and past the Assaranca Waterfall, are the Maghera Caves. It’s said that during penal times, locals would hide out here to avoid capture. Check out Nancy’s Bar, a renowned traditional pub run by the McHugh family – and the epitome of friendliness. Sometimes the roads to nowhere or the back of beyond are the only roads worth traveling. Refresh the mind, body and spirit between Glencolmcille and Donegal. Although Glencolmcille's remoteness has been described as "the back of beyond", that's an injustice to the beauty of this area, which is peppered with ancient dwellings and megalithic tombs. 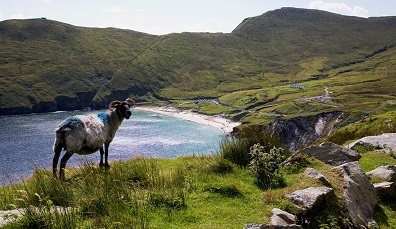 Glencolmcille owes its name to Saint Columba, one of Ireland's three patron saints, who came to this glen during the 6th century. Once notorious for smuggling, a trip to the Silver Strand will reward you with stunning views of a gorgeous beach surrounded by rocky cliffs, while guided tours of the Folk Village offers a warm Donegal welcome and an intimate experience of past ways of life. 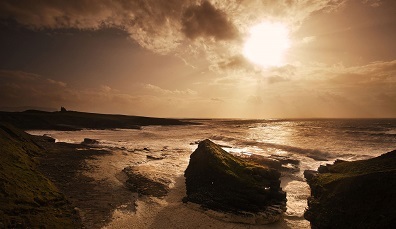 Check in on Malinbeg for more of the air that leaves your lips salty and your mind refreshed. 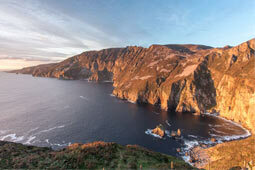 One of the highlights of any visit to Donegal are the wondrous Slieve League sea cliffs, among the highest sea cliffs in Europe at 601m (1,972 feet). Leave your car behind and enjoy the walk to the viewing platform, where spectacular views of Donegal Bay and the Sligo Mountains await you. And look out too for stones marking out the word "Éire", a navigation aid for aircraft during World War II. Nearby, at the tiny harbor of Teelin, a brown-cowled figure clasps his hands solemnly in prayer alongside a boat. 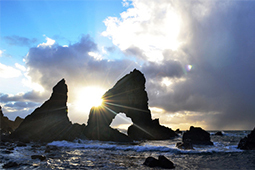 This memorial symbolizes the 5th century monks who left from this historic part of Donegal to sail the treacherous seas to Iceland. Treat yourself to lunch at Kitty Kelly’s, which specializes in seafood and French cuisine. 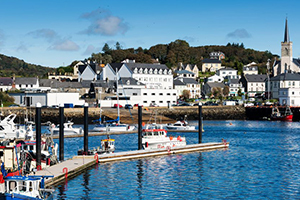 Killybegs overlooks Donegal Bay, across to the lighthouse at St John’s Point and onto the distinctive Ben Bulben mountain in Sligo. 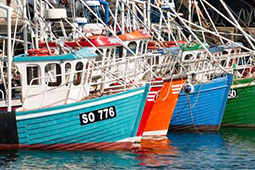 As Ireland’s number one fishing port, it has a profound connection to the ocean, and this is explained beautifully in the Maritime and Heritage Centre. At the mouth of the bay is Donegal Town, or Dhún na nGall (Irish), which translates as Fort of the Foreigners, referencing a time when Vikings made the town their stronghold. From Donegal Castle to the Franciscan Friary ruins, historical significance is everywhere. To see this pretty spot from the shores, hop onto the Donegal Bay Waterbus for gorgeous views of the Bluestack Mountains, Seal Island and the Bay itself. Book a table at Harvey's Point, voted best hotel restaurant at the Irish Restaurant Awards. Or for something more casual, drop into The Harbour Restaurant or The Village Tavern. Delicious.